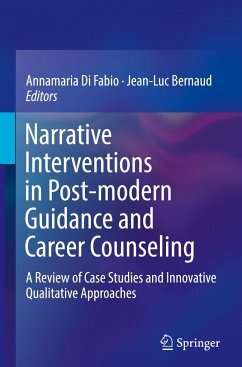 This book presents an international review of the principle new post-modern narrative interventions in Guidance and Career Counseling. 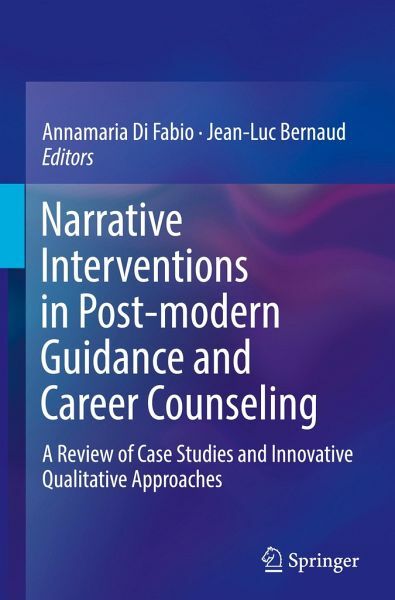 With contributions from the most important scholars in the field this volume presents new qualitative approaches and tools to assess the effectiveness of narrative interventions. It provides a critically needed review of case studies regarding the most innovative and updated interventions. This volume explores the field of Guidance and Career Counseling according to the most recent post-modern theories in career construction, life construction and life meaning, the psychology of working and the relational theory of working. It offers an international perspective for the application of effective post-modern Guidance and Career Counseling interventions to facilitate individuals' life and career management. The volume serves as a fundamental instrument and reference for researchers, professionals, counselors, career counselors, professors, and students interested in the field. Annamaria Di Fabio, Ph.D., is Full professor of Work and Organizational Psychology at the Department of Education and Psychology (Psychology section), University of Florence, Italy. She is Rector's delegate for "Psychological Counseling in Guidance and Job placement" and director of both the following International Research and Intervention Laboratories: Psychology for Vocational Guidance, Career Counseling and Talents (LabOProCCareer&T); Cross-Cultural Positive Psychology, Prevention, and Sustainability (CroCPosPsychP&S). She is Associate editor of Personality and Individual Differences (PAID), Co-editor of Orientation Scolaire et Professionnelle, editor-in-chief of Counseling Italian Journal of Research and Intervention. She is the author of more than 170 peer reviewed articles and 70 books or chapters. Jean-Luc Bernaud, Ph.D., (1993, Université Paris V, Director Michel Huteau) gained the Habilitation to direct research in psychology (2006, Lille III University, promoter Claude Lemoine), was a psychologist in a company from 1987 to 1995. Then from 1995 to 2011, he was a lecturer in differential psychology and then professor in work psychology at the University of Rouen. Since 2011 he is Professor at the Inetop-Cnam, he teaches in professional master and research in DECOP and he is part of the CRTD laboratory - Center of research on the work and the development. He is responsible for the Professional Master in Counseling Psychology and Counseling (starting in September 2015), responsible for the team "Psychology of guidance" of the CRTD laboratory of Cnam, and associate editor of the international journal " Psychologie du Travail et des Organisations"
Life construction dialogue intervention: A case study on an Italian worker using comparatively FCA, LAQuA and CCIO as qualitative evaluation tools (Violetta Drabik-Podgórna).- Conclusion.